You have all that music and other audio content to listen to on your iPad, and beyond downloading and organizing your selections, that’s what Music is mainly for. You’ll find the typical playback tools in the Music app, but in case you want a refresher, here’s the quick rundown on how to use Music as a player. Playing an audio file is simple, and you’ll be glad to hear Music can continue to play in the background while you go about using other apps. If you’re browsing in Safari, for example, with music playing in Music, you can double-tap the Home button and a mini toolbar opens where you can control playback without leaving the browser. If your iPad is showing the lock screen, you can also use controls displayed there to control music playback for currently playing selections. Locate the item you want to play using the methods I describe in previous sections of this chapter. Tap the item you want to play from the list that appears. If the item is stored on iCloud, tap the iCloud symbol next to it to download it before you can play it. The song begins playing. Note: If you’re displaying the Songs tab, you don’t have to tap an album to open a song; you need only tap a song to play it. If you’re using any other tab, you have to tap items such as albums or multiple songs from one artist to find the song you want to hear. Tap Now Playing to display the album cover full screen. If you want to go to a specific item, such as a song in the album that’s playing, tap the item you want to play from the list that appears. Use the Previous and Next buttons that display when you tap the top of the screen, shown, to navigate the audio files. The Previous button takes you back to the beginning of the item that’s playing or the previous track if nothing’s playing; the Next button takes you to the next item. Tap the Pause button to pause playback. 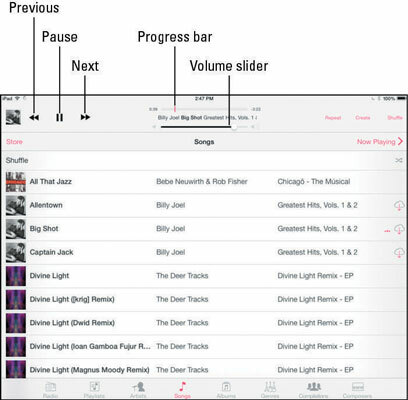 Tap and drag the line that indicates the current playback location on the Progress bar left or right to “scrub” to another location in the song. Don’t like what’s playing? 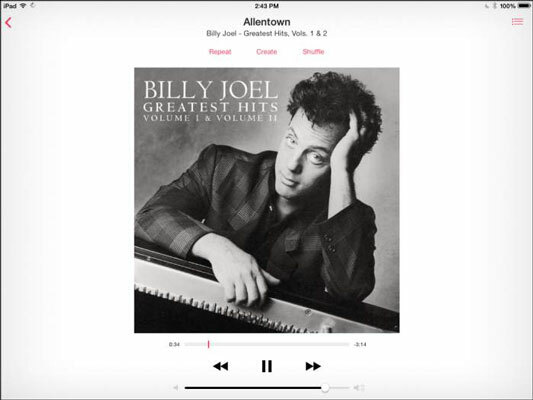 Tap the Back to Library arrow in the bottom-left corner to return to the Library view, or tap the Album List button in the top-left corner to show other tracks in the album that’s playing and make another selection. The Home Sharing feature of iTunes allows you to share music among up to five computers that have Home Sharing turned on (iOS devices and Apple TVs, second generation or later, don’t count against that limit). To use the feature, each device has to have the same Apple ID on your network. After you set up the feature via iTunes, you can retrieve music and videos from your iTunes shared library to any of the devices. For more about Home Sharing visit the website.